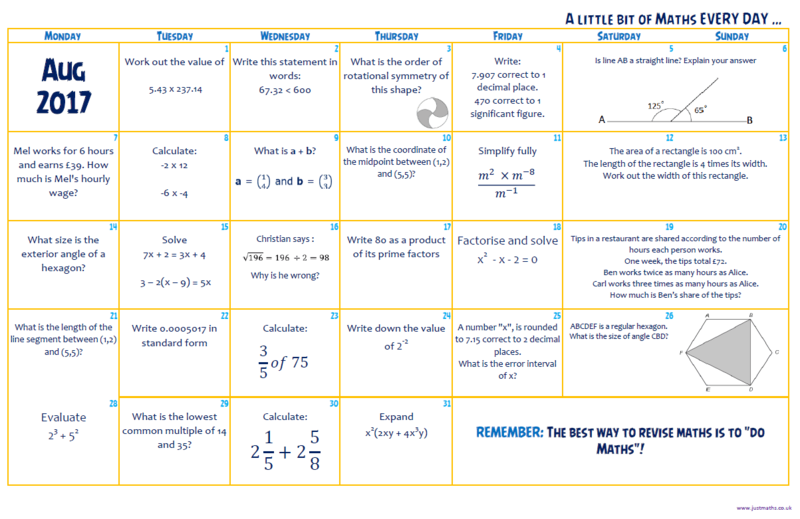 Here you go … Monthly Maths – August 2017 v2 calendar. Thanks again so much for this. But, Q18 ; factorisable? … or one is allowed to use formula or complete square ??! yep, you’re right .. have updated with V2.. holiday brain! I LOVE THIS!!!!! Is this something that will be done for this school year and how do you implement this? Hiya, I’ve been emailing it direct to parents! Awesome. I can’t email as most my parents don’t have email I have decided to use it as extra credit points. The kids loved seeing the problems for the month and were excited to get started.